I have seen spectacular sunrises, but the sunrise this morning was as spectacular as any I have seen, perhaps even more so. Sadly, I did not have a charged phone nor camera… so I do not have pictures. I had to drive to the extreme north end of Folly Beach for the sunrise and walk out to the northernmost corner… but it was worth it. When I arrived, the sun was not visible due to cloud cover. Then suddenly, the clouds gloriously parted and the sun was visible over the horizon. I watched intently as the sun began to climb the sky over the Atlantic. A glowing, golden orange ball in the sky. It’s reflection colored the water and the waves that broke in its light …a TRULY surreal scene. That is the sunrise that got away, without any pictures being taken. After I reluctantly broke free from the sun’s entrancing gaze … I headed back to the campsite and met up with everyone where we loaded up and headed back out to the beach. Brad brought my camera phone… fully charged and the picture-taking commenced. Folly Beach has a somewhat dog friendly policy. No dogs on the beach from 10 AM to 6 PM, from May to October. Many places prohibit dogs entirely on the beach during the summer months. However, where we walked to on this day had many “No Dogs Allowed” signs, it was a wildlife sanctuary. Arya had to leave the beach. We were in search of pristine beaches and just off-shore lighthouses. 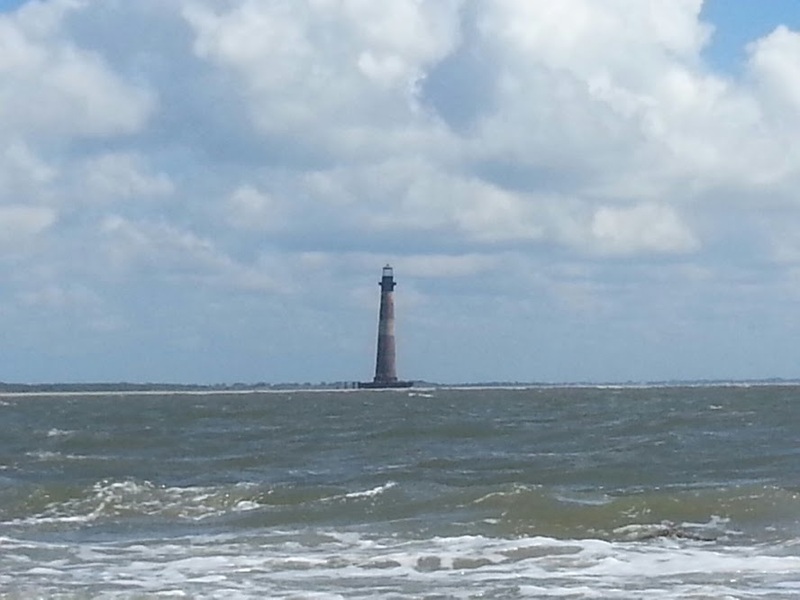 As we approached the northern most corner of Folly Beach the Morris Island Lighthouse became more and more visible. I had not seen a ‘real’ lighthouse in several years. I used the ‘zoom’ function here. As we turned the corner we saw this beautiful beach. Pelicans are seemingly everywhere and I was fortunate to capture a couple flying overhead… with the tree limb in the foreground. 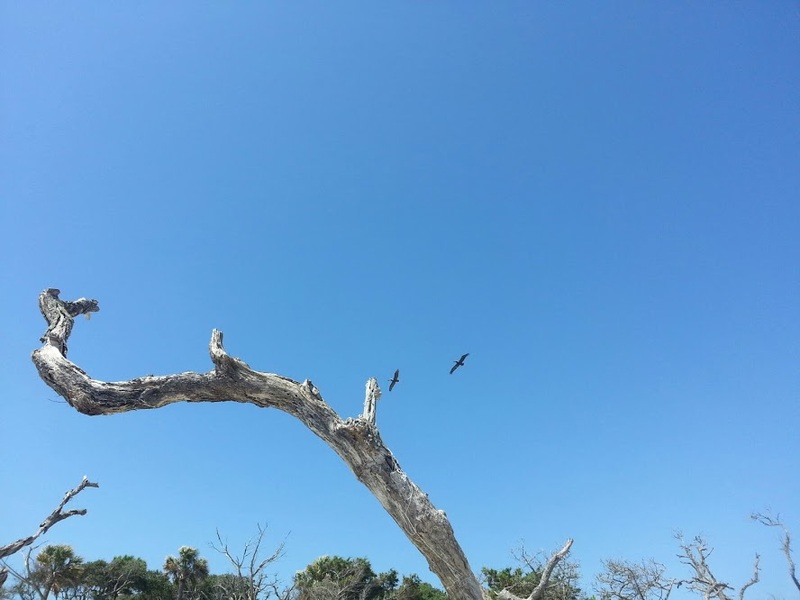 (below) We watched many dive-bombing for food. Watching pelicans feed is always a very primal experience. Love it! I decided to walk behind this tree and take a picture with the water and the lighthouse (far right) in the background. Glad I did, I love this picture. Lastly these two panoramic views. At this point it was afternoon, a four-hour drive ahead of us… so we made the long walk back. I do plan on returning to this island … the sooner the better. I miss it already! 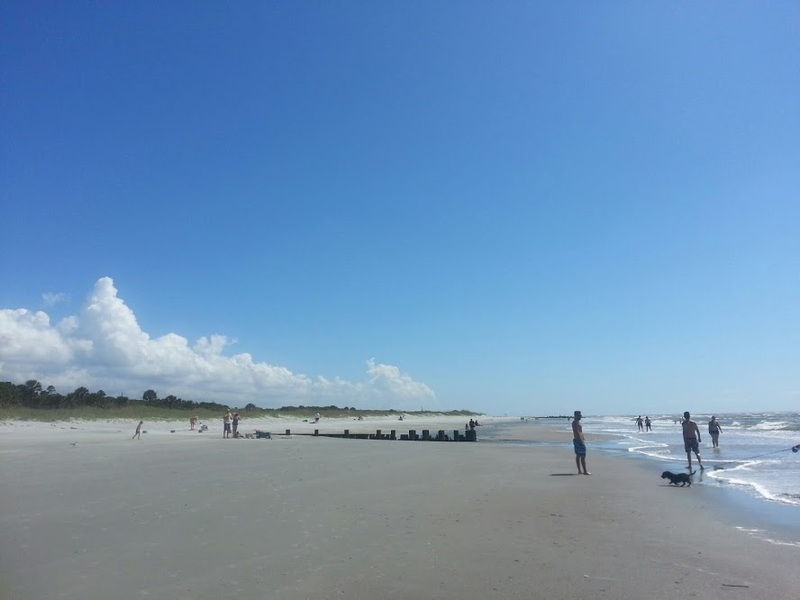 Summing Up Folly Beach and James Island. 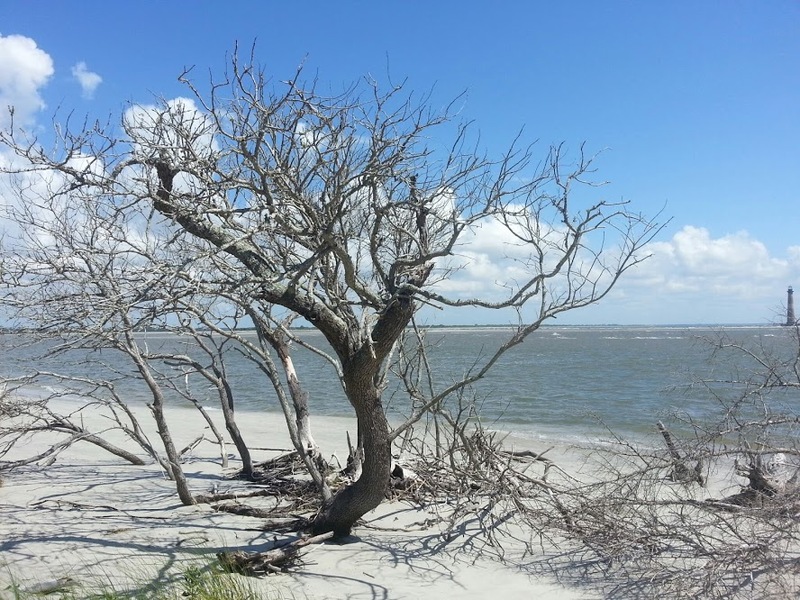 First the greater Charleston Area – there are many surrounding beaches that we did not visit. 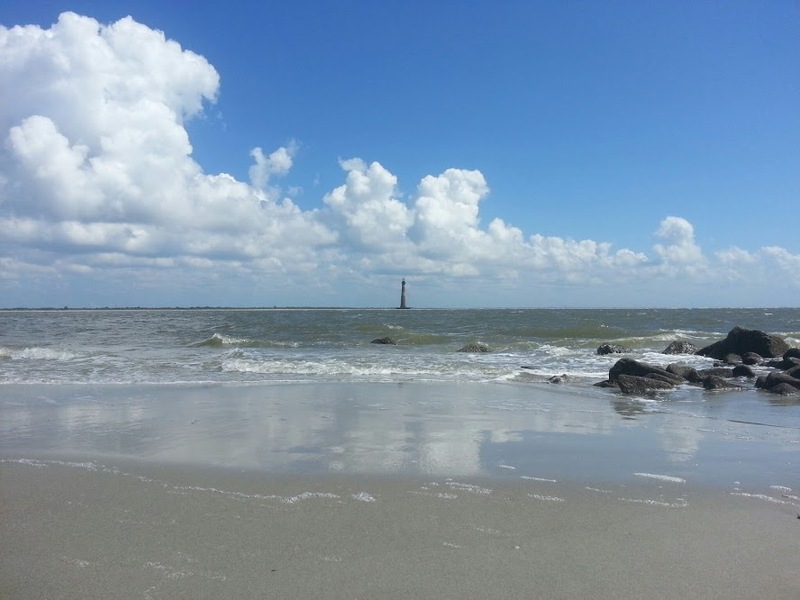 There is so much to do and see in the greater-Charleston area, you can’t go wrong visiting this area. 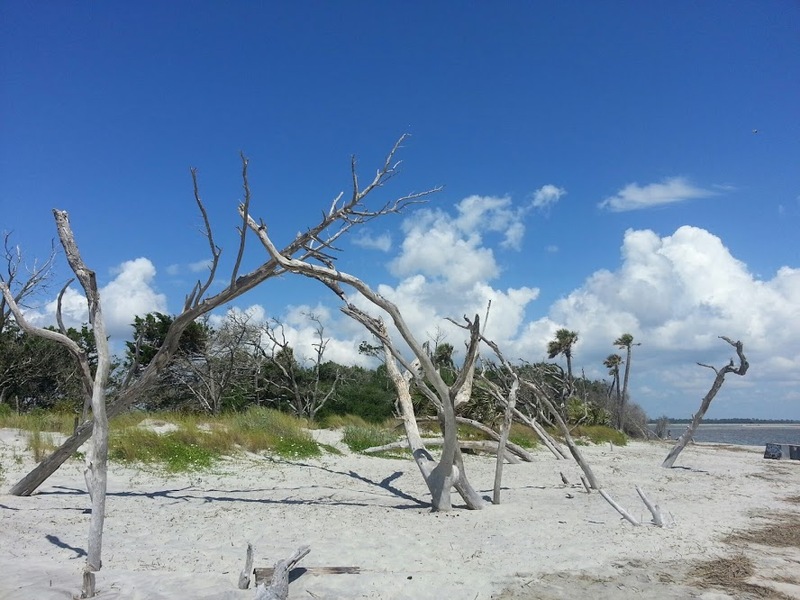 James Island – I’m very impressed with James Island. The County Parks are numerous and well maintained. As usual we packed many activities into our days at the beach. I stayed on-plan, eating only fatty meats and low-carb vegetables. I drank cabernet sauvignon and one Michelob Ultra my son bought for me, (2.6g of carbs). I love to be mindful in nature. I was able to do that this weekend while spending quality time with my sons and staying on-plan. It was a win, win, win. Still thriving … not ‘just’ surviving.